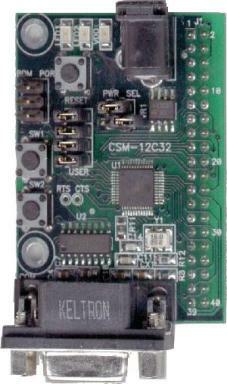 The CSM-12C32 is an evaluation or demonstration module for the Freescale MC9S12C32 microcontroller. The included wall plug, DB9 serial cable, sample software tools, examples, and debug monitor makes application development quick and easy. A background DEBUG port is provided for development tool use and is compatible with HCS12 BDM interface cables and software. A 40-pin connector allows the CSM-12C32 module to be connected to an expanded evaluation environment such as the Axiom Manufacturing, MCU Project Board. Module Size 2.2" x 1.6"
Supplied with DB9 Serial Cable, Documentation (CD), Manual, and Wall plug type power supply.